When I first wrote about tomatoes, before the Marketplace/ Tomato post, I confess I’d never seen tomatoes sold anywhere else in the world in the same way. 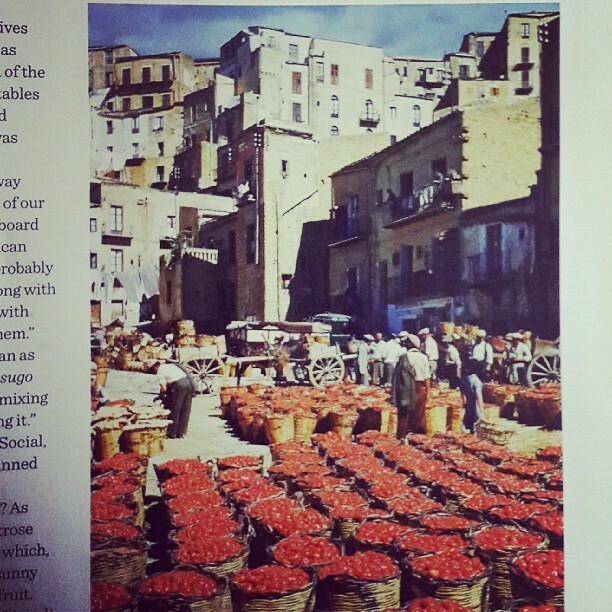 Till I woke up on a saturday morning and came across a photo – of baskets of tomatoes in an Italian Piazza while flicking through ‘Waitrose Kitchen’, the in-house magazine of the British store. The September 2013 issue of the magazine features tomatoes on page 57. The writer, Rebecca Seal shares the beauty of tinned tomatoes -a store cupboard hero, and the provenance of Waitrose’s tinned tomatoes from sunny Italy. Nestled in a corner sits a beautiful photograph of a market, surrounded by huge stone buildings and on the ground, row after row of tomatoes in baskets. 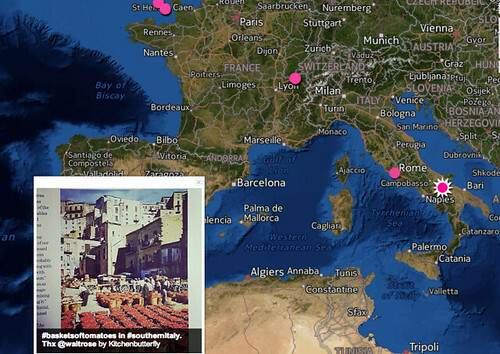 The area is in the south of Italy, around the hilltop town of Ascoli Satriano in the Apulia region. I was stunned and thrilled to find other parts of the world were tomatoes are sold in a manner similar to in our Nigerian markets. 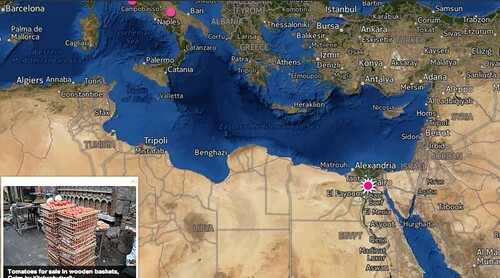 And it prompted me to ‘search’ for the containers that transport bulk tomatoes around the world. I unearthed various gems – from the bushels of the Channel Islands and North America, to the wicker baskets of Asia and Africa, and the flats of Italy. 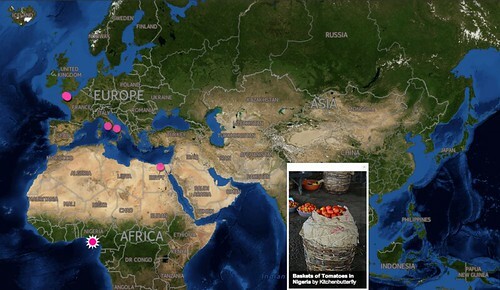 Tomatoes have come a long way. The Evil History of Tomatoes: Originally cultivated by the famously blood thirsty Aztecs and Incas as early as 700 A.D., the tomato is native to the Americas. The Spanish explorer Cortez conquered the Aztec city of Tenochtitlan, later to be renamed Mexico City, in 1521. 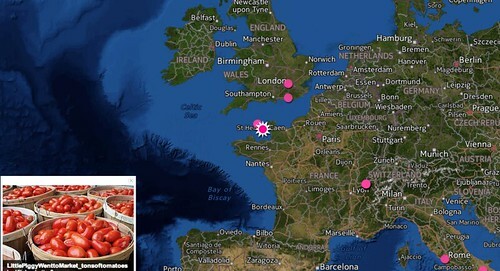 It is presumed that the tomato found its’ way across the Atlantic shortly after. 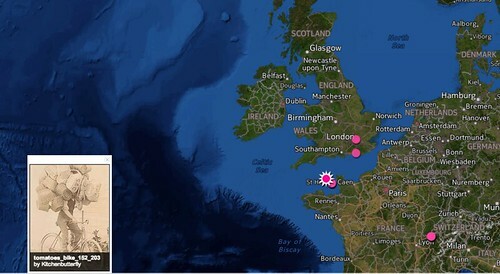 When explorers brought back seed to Europe from Mexico. The name “tomato” derives from “tomatl,” its name in Nahuatl, the language of the Aztec people. The English form “tomate” first appeared in the 17th century, and was later modified to “tomato,” probably under the influence of the more familiar “potato.” Most of these early fruits were yellow, and became known as “manzanas” (apples) and “pomi d’oro” (apple of gold). They were considered poisonous but appreciated for their beauty. Though I haven’t gotten to the bottom of how tomatoes began their ‘bulk’ lives for transport, I’ve seen that they were gathered, and still are transported in wicker baskets. In the early days, the wicker baskets were shipped back to Guernsey but chip boxes were introduced in time. Perhaps they discovered that wicker baskets might promote fungal growth. Perhaps not. BBC’s A History of The World: The Isle O’Sun chip basket was first introduced in 1953 and was used to export ‘Guernsey toms’ to the UK. At that time the tomato industry was Guernsey’s economic mainstay, employing thousands of people, both in growing and in associated trades. The Isle O’Sun logo was used by the Guernsey Tomato Marketing Board, an organisation founded in 1952 to oversee the marketing of all Guernsey tomatoes to more than 150 markets throughout the UK. 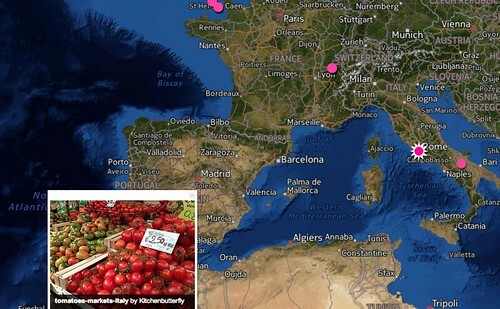 Prior to this, each grower could send tomatoes to whichever market they chose. In 1961 the ‘chip’ was superseded by the ‘Dutch Tray’. 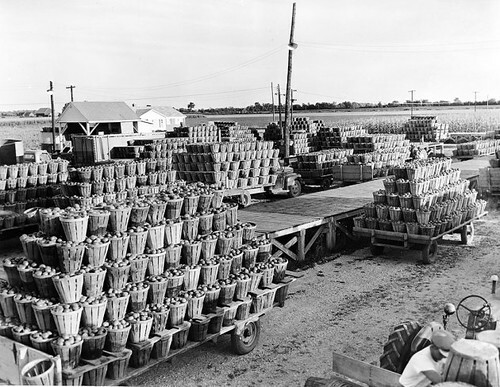 By this time, millions of ‘chips’ had found their way to the UK, the busiest week being the week ending 11 June 1955 when 793,966 chip baskets were exported. 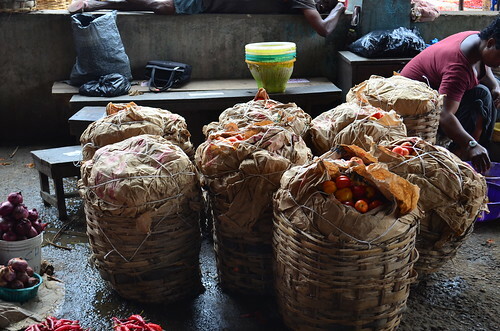 In Nigeria, tomatoes are sold in huge wicker baskets and are transported from production centres in the north and west to markets around the country. Its no secret that there is a LOT of waste in our country especially with perishable produce like tomatoes for a number of reasons. These include the containers in which the fruit and vegetables are packed, poor preservation facilities and the propensity for mechanical damage during transport from source to market. Transport Logistics is a delivery company that has corrected these flaws giving other companies and small businesses assurance of the growth of your company and the safety of all produce that is being transported. In addition, it appears that wicker baskets add another layer of complexity in the health of produce. A study was carried out by Kutama A. S., Aliyu B. S., Muhammed I, called Fungal Pathogens Associated with Tomato Wicker Storage Baskets. The researchers found that wicker baskets habour more pathogens which lead to post-harvest losses. A sample of 10 wicker baskets used for storage and transportation of tomato Lycopersicon esculentum Linn. fruits were screened for fungal species. Swaps from the baskets were cultured on SDA plates from which fungal 200 isolates were obtained and grouped into 5 genera based on macroscopic and microscopic examinations. The Identified fungal genera were Aspergillus spp., Alternariaspp, Penicillium spp., Rhizophus spp. and Saccharomyces spp. The genus Aspergillus had the highest frequency of occurrence (25 %) while Saccharomyces had the lowest (16.5 %). Pathogenecity test of the pathogens on healthy tomato fruits showed that 3 out of the 5 genera have the potentials to cause lesions on intact fruits, suggesting that pathogenic fungi on wicker baskets are possible sources of post-harvest and economic losses. Perhaps the most rewarding part of this ‘study’ of mine, was the discovery of Practical Action: an international non-governmental organisation (NGO) using technology to challenge poverty in developing countries. 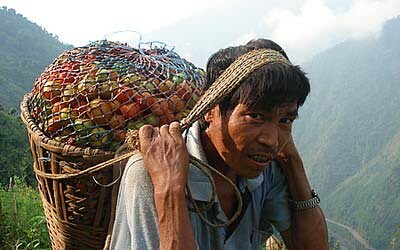 Take the example of the work they’ve done in Nepal introducing gravity ropeways. 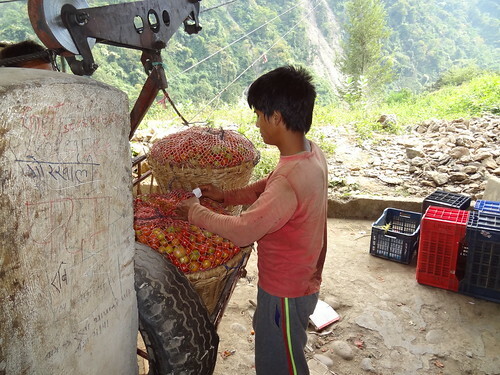 Ropeways, which help Nepalese farmers who live on the mountainside and grow fruit and vegetables, including tomatoes get their produce down from the mountains to market, skipping a long, dangerous walk down the mountain side and over a river. Read more on Gravity Ropeways and see photos of the ropeways in action. I searched for tomatoes in containers and was thrilled to see them sold in bushels. Bushels took me back to ancient times, I know the bible is replete with stories of them.The Bible encourages us not to hide our lights under a bushel. According to Wikipedia, a bushel is an imperial and U.S. customary unit of dry volume, equivalent in each of these systems to 4 pecks or 8 gallons (9.31 U.S. liquid gallons). It is used for volumes of dry commodities (not liquids), most often in agriculture. It is abbreviated as bsh. or bu. In modern usage, the dry volume is usually only nominal, with bushels referring to standard weights instead. 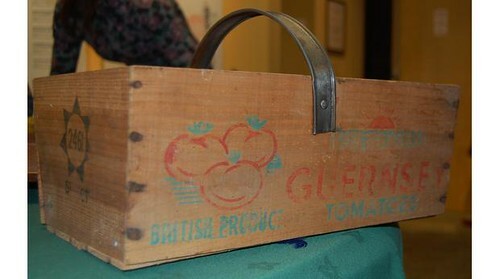 From the Leamington factory in Canada where Heinz have a factory, to markets across the continental United States and the Channel islands, bushels of tomatoes are a common sight when they are in season. 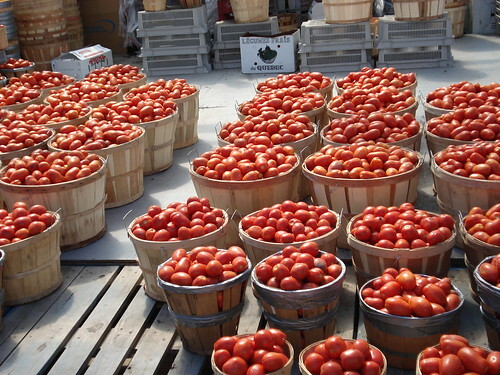 Teri Vlassopoulos of Bibliographic writes on her blog in Scrapbook #10 where she bids Montreal goodbye for Toronto, about the wonders of Montreal’s Jean Talon market, where summers are full of tomatoes in Bushels. Source: Teri Vlassopoulos of Bibliographic.net. 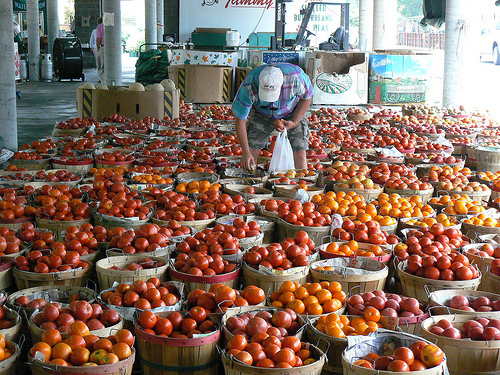 Bushels of tomatoes at Jean Talon Market, Montreal. 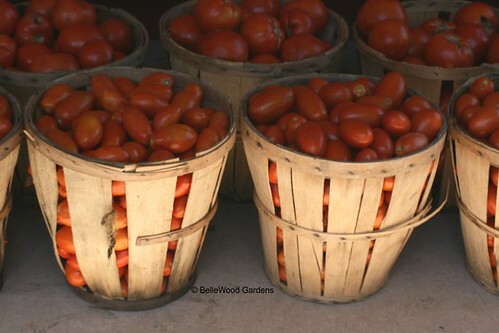 From Tennessee, where the hot summers are perfect for growing a sea of tomatoes,…. …to Philadelphia, bushels of tomatoes are the rage bearing banners of summer’s start and finish. Inspiring cooking on a scale comparable with that of apple butter and apple sauce making! 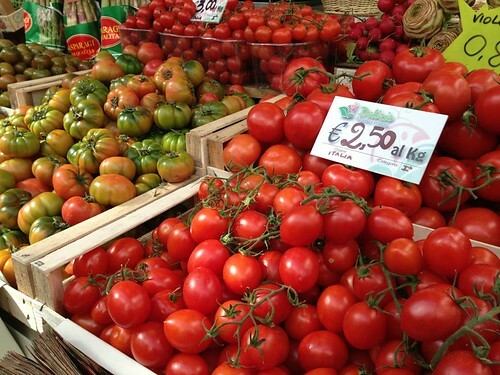 In Italy, tomatoes can be found in flat baskets – many thanks to the Eating Italy food tours team for letting me use the photo! As they can too in Cairo, Egypt. This brings me to the end of my ‘weird’ exploration. I’m not sure that my conclusions are more than ‘tomatoes are sold in various sized and shaped containers round the world!’. I also know what a bushel is too! Many thanks to everyone who let me use their photo: I appreciate it. Have you come across tomatoes in other containers?